Explanation: Scanning the entire sky in gamma-rays, photons with over 50 million times the energy of visible light, the Fermi mission's Large Area Telescope (LAT) explores the high-energy universe. This all-sky map constructed from 3 months of LAT observations (August 4 to October 30, 2008) represents a deeper, better-resolved view of the gamma-ray sky than any previous space mission. 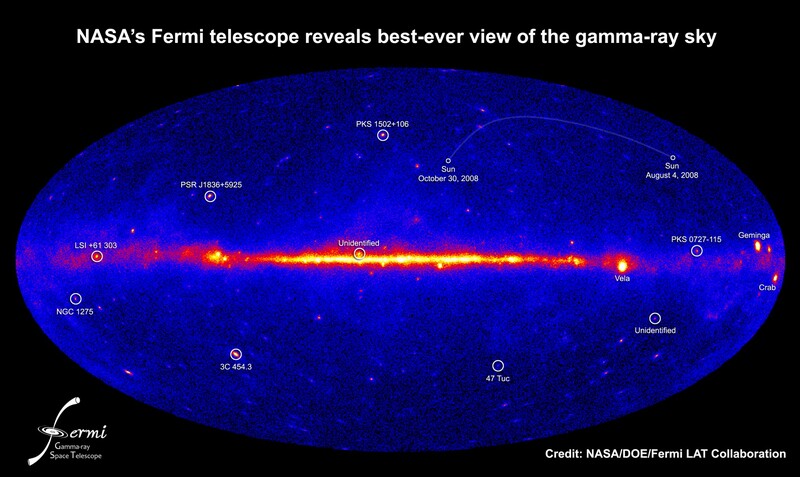 What shines in Fermi's gamma-ray sky? 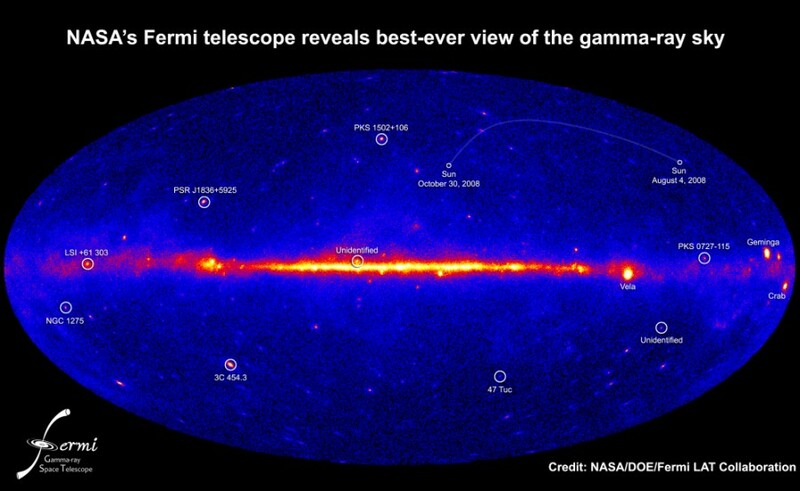 A new paper describes the 205 brightest gamma-ray sources, but this map highlights a Fermi "top ten" list of five sources within, and five sources that lie beyond our Milky Way Galaxy. Within our galaxy: the Sun traces a faint arc across the map between the observation dates, LSI +61 303 is an X-ray binary star about 6,500 light-years away, PSR J1836+5925 is a type of pulsar (spinning neutron star) that is only seen to pulse at gamma-ray energies, and 47 Tuc is a globular star cluster some 15,000 light-years away. A fifth galactic source (unidentified), just above the center of the galactic plane, is intriguing because it is a variable source and has no clear counterpart at other wavelengths. Beyond our galaxy: NGC 1275 is a large galaxy at the heart of the Perseus galaxy cluster some 233 million light-years away, while 3C 454.3, PKS 1502+106, and PKS 0727-115 are active galaxies billions of light-years distant. Another unidentified source, seen below the galactic plane, is likely beyond the boundaries of the Milky Way. Its nature remains a mystery.